When things fall apart, civility snaps, and a huffing, puffing bully blows our brick houses down, we have to do what our children know to do: wipe our tears, gather it all up block by block, and come to the table to rebuild. That’s the art of creative, hopeful, American thinking. And, you know, LEGOs. 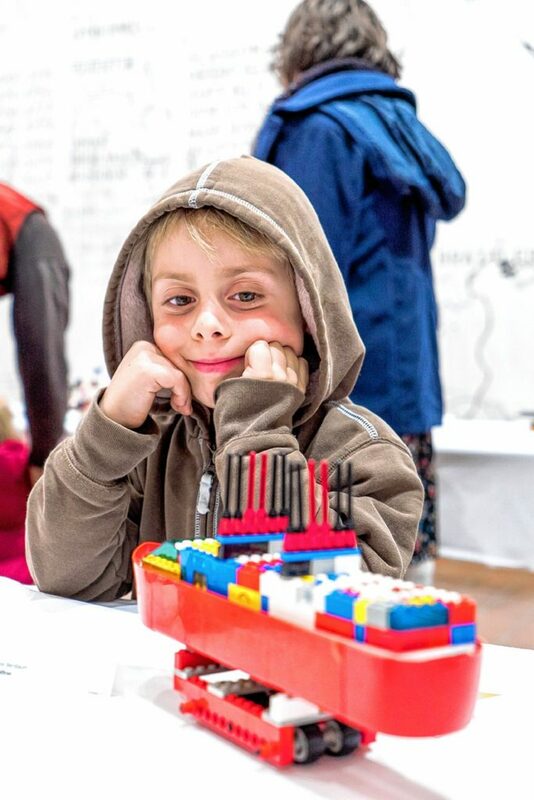 This week, the Brattleboro Museum and Art Center invites master builders of all ages to design and build original LEGO sculptures, which will be on display for three days – right alongside the museum’s other main exhibits. The showcase, which has become a fall tradition in this town over the past decade, is fun, communal, draws hundreds of visitors, and prompts entries from multiple states and contestants ranging in age from toddlers to senior citizens. Every entry that is submitted will be displayed, but a panel of judges will award prizes based on creativity and craftsmanship in six age groups. There will also be overall prizes for Best in Show, Best Architectural Design, Best Use of Moving Parts, Best Title, Best Diorama, and Best Space-Themed Creation. Entries (which in the past have included a replica of the museum, an amusement park, a model of Brattleboro’s Harris Hill ski jump, a working wind-up clock, and a working pinball machine) must be delivered to the museum on Wednesday, Nov. 16, between 4-6 p.m., along with an entry form and $5 entry fee. It’s a competition, sort of, but the focus is on celebrating creativity. Honestly, we couldn’t have picked a better month to get out there and build something all together, from the ground up. Brattleboro Annual LEGO Contest and Exhibit: Friday to Sunday Nov. 18-20. $4-$8; free to members and ages 12 and under. Brattleboro Museum and Art Center, 10 Vernon St., Brattleboro. (802) 257-0124, brattleboromusuem.org.